It's always a pleasure to oblige when my good friends Bob Prew and Ken Whittaker over at King's Heath Walk of Fame contact Yours Truly KJS and elobeatlesforever (elobf) to highlight their now annual Beatles All You Need Is Love Fest which is being held this year on Sunday 10th February, especially remembering that Beatles legend John Lennon once stated that ELO were the "son of [The] Beatles". It was the ultimate of compliments and another huge nod to the influence of The Fab Four on Birmingham's finest whose hometown hosted The Beatles' when they played their maiden live performance on Friday 15th February 1963 - the first of three appearances at King's Heath Ritz Ballroom in the very home of 'Brum Beat'. The Beatles All You Need Is Love Session is up first featuring an eclectic array of musicians and runs from 3PM until 6PM at Fletcher's Bar, York Road, King's Heath. Tickets are priced at £4 each (*plus booking fee) and can be purchased in person from Kitchen Garden Cafe and/or wegottickets with tickets on the door priced at £5 each (if available). Acclaimed Beatles tribute Made In Liverpool will then strike up the band from 7PM onwards down the road at the Hare & Hounds. Tickets are priced at £12 each (*plus booking fee) and can be purchased in advance via Skiddle or on the door (if available). 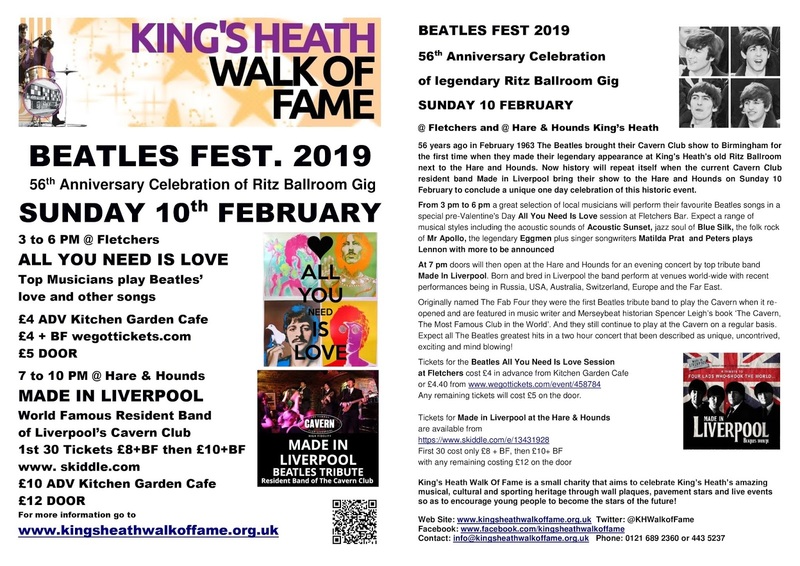 elobeatlesforever (elobf) recommends King's Heath Walk Of Fame Beatles Fest 2019 to those enlightened folks who enjoy the music of ELO, Jeff Lynne, Roy Wood, The Move, The Idle Race, 'Brum Beat', The Beatles and related artistes.